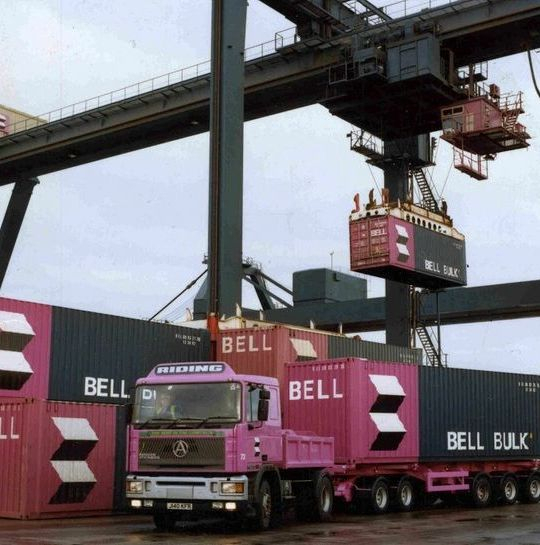 One of Ridings many contracts was the movement of loaded 34 ton Bell Line containers between ICI's Terephthalic Acid plant at Wilton and the Bell container terminal at Tees Dock, a distance of only around three miles. This movement was outside of the normal C and U regulations and was classed as 'special types' which enabled Riding's to design their own specialised outfit for the job. 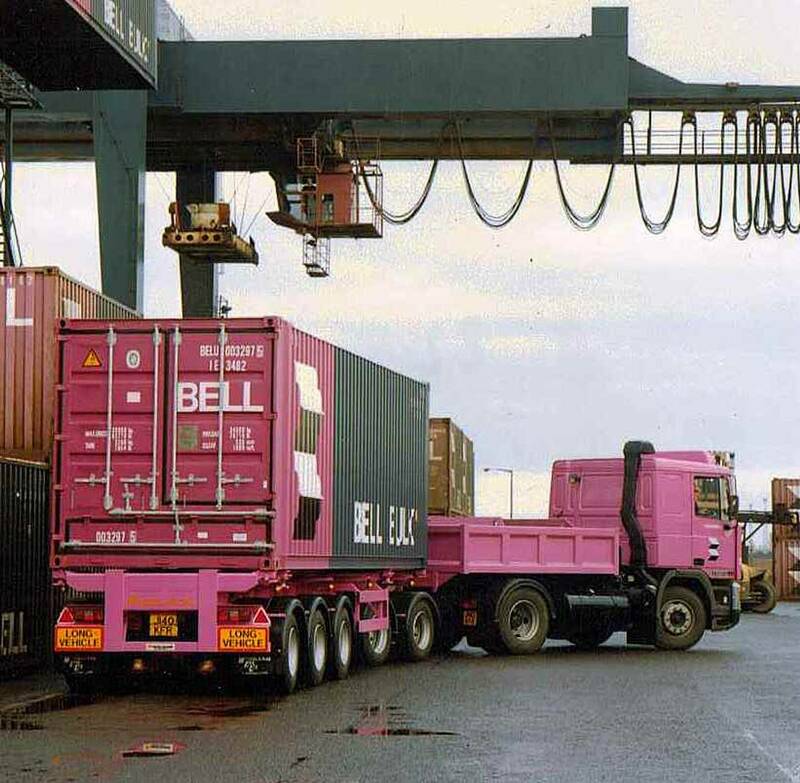 Two special trailers, which grossed at 65 tons, were built by Wheelbase Engineering of Blackburn. Also required was a tandem axle dolly which was used under a normal 30 foot skelly trailer. 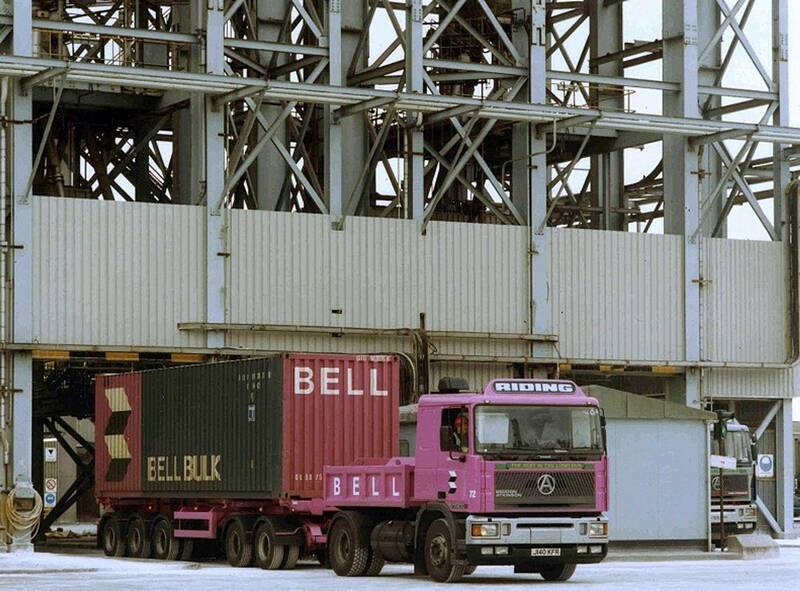 Seddon Atkinson Strato 4x2 tractor unit Reg No J140 KFR Fleet No 72 'Hannibal' along with Seddon Atkinson Strato 4x2 tractor unit Reg No J94 GCX Fleet No 76 'Goliath' were both converted into ballast tractors, painted in Bell Line livery, and both used for the job. When coupled up to the trailer the overall length was around 60 feet and with seven axles and twenty six wheels little wonder it was nicknamed 'The Beast'. 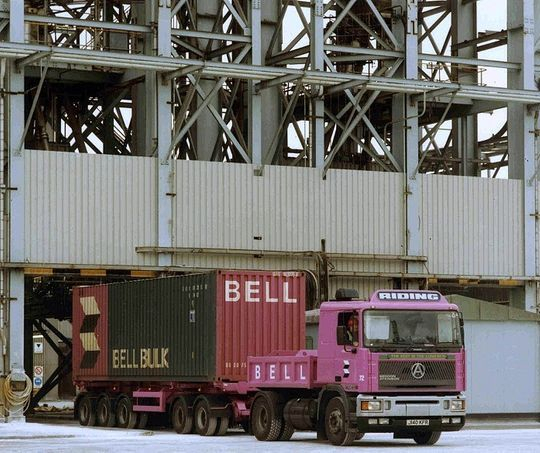 Seddon Atkinson Strato 4x2 ballast tractor Reg No J140 KFR Fleet No 72 is pictured here about to leave the ICI Terephthalic Acid plant at Wilton with a loaded container destined for the terminal at nearby Tees Docks. 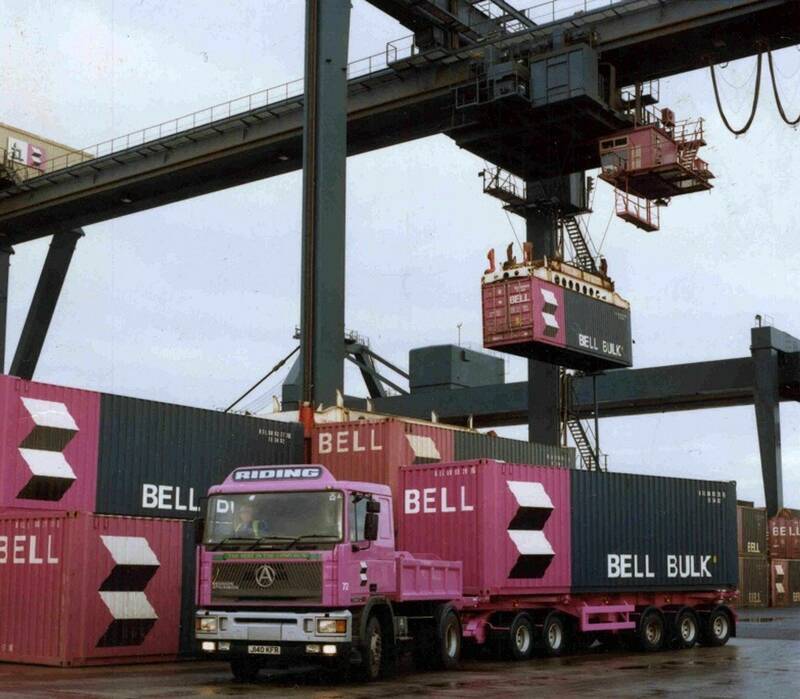 Seddon Atkinson Strato 4x2 ballast tractor Reg No J140 KFR Fleet No 72 'Hannibal' arrives at Bell Lines container terminal at Tees Dock. Seddon Atkinson Strato 4x2 ballast tractor Reg No J140 KFR Fleet No 72 'Hannibal' moves into position in preparation for the container to be lifted off. 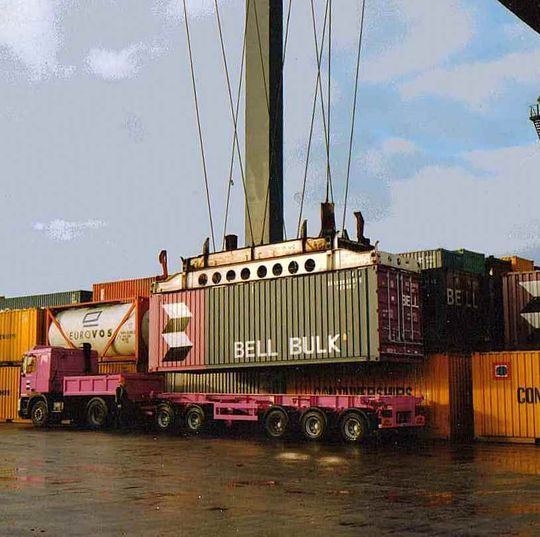 Loaded with 34 tons of Terephthalic Acid the container is lifted off at the Bell Line container terminal on Tees Dock. A close up shot of Seddon Atkinson Strato 4x2 ballast tractor Reg No J140 KFR Fleet No 72 'Hannibal' while coupled to it's tandem axle dolly. 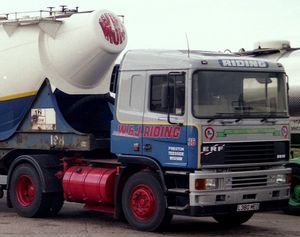 When scrapped this vehicle was replaced by a converted ERF EC 12 4x2 tractor unit as can be seen the the two pictures below. Seen here in August 2012, now in TDG livery, ERF EC12 Reg No L380 MEO was originally 4x2 tractor unit Fleet No 26 'Sanspareil' in the W & J Riding fleet. 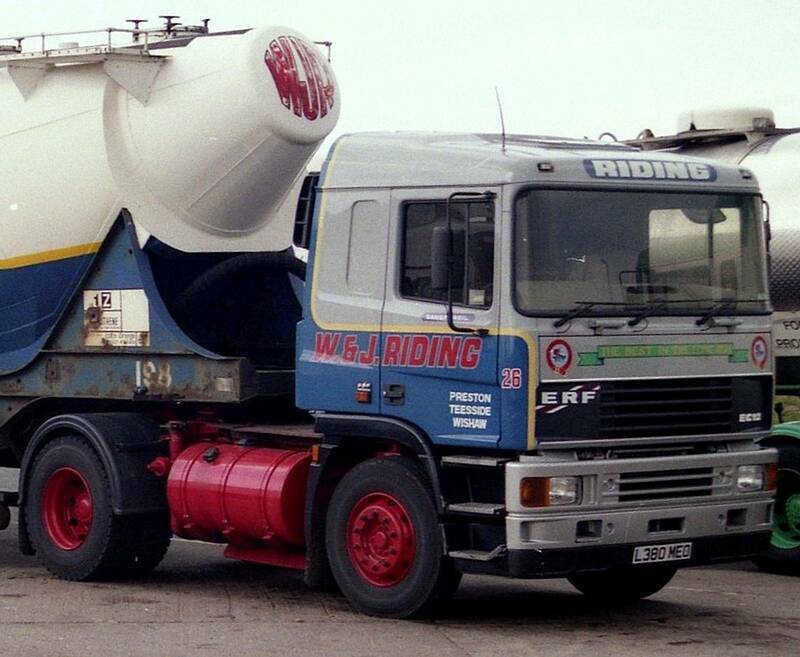 Purchased new by Riding's in December 1993, at a cost of £37.295 plus vat, L380 MEO was originally assigned to hauling a 2000 cubic foot Carmichael tank on the Wilton - Pontypool movement of Nylon chip. 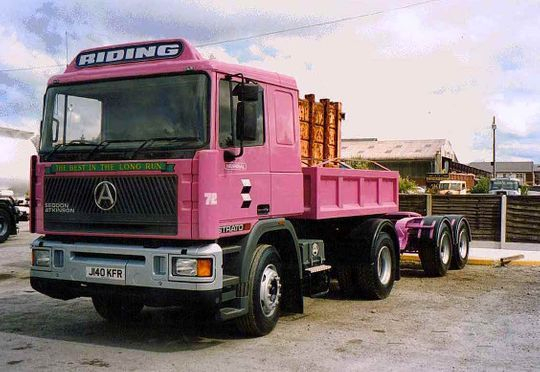 After many years use a tractor unit it was fitted with a ballast box that had originally been used on one of the old Strato's that had been scrapped. At the ripe old age of 21 years old this Sandbach built ERF was finally withdrawn in 2014.